Olympic Pork Crackle contains almost no carbohydrates and no added sugars. It also has 17 grams of protein and only 9 grams of fat. That’s nine times the protein and less fat than your average carb packed potato chip. 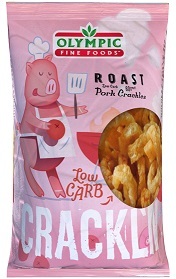 Try the tasty Roast Pork Crackle, it is light and crunchy. Just like mum’s pork from the oven, only less fat! Serve with your favourite beverage! Love our Pork Crackle – Roast product?